Stability :Store at 4oC (add 0.1% NaN3) for several months, and at -20oC for longer periods. For optimal storage, aliquot target into smaller quantities after centrifugation and store at recommended temperature. For most favorable performance, avoid repeated handling and multiple freeze/thaw cycles. Sample Data :Western blot of rat cortex homogenate showing specific immunolabeling of the ~ 18 & 22kDa MBP protein. 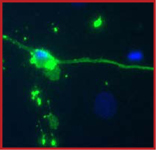 Sample Data :Rat mixed neuron/glial cultures stained with chicken anti-Myelin Basic Protein (green). Blue is a DNA stain. Note that the Myelin Basic Protein antibody stains an oligodendrocyte and some membrane shed from this cell. Other cells in the field include neurons, astrocytes, microglia and fibroblasts, all of which are completely negative. Scientific Background :Myelin Basic Protein (MBP) is a major protein of the myelin sheath. The region of the protein that is required for folding, polymerization and substrate specificities is conserved among various species. This conserved region may also have a specialized role in protein-lipid interactions in the myelin membrane (1). MBP is expressed in oligodendrocytes, thus antibodies to MBP are useful tools for identifying this cell type. In the central nervous system there are there different forms of the protein made by alternate transcription from a single gene. These isoforms have molecular weights of 21.5, 18.5, and 17.2 kDa. 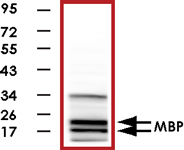 Because the two smaller isoforms have similar molecular weights, Western blots using MBP antibodies typically result in two bands. 1. Chapman, et al: Confomation of myelin basic protein and its role in myelin formation. Adv Exp Med Biol 1978;100:207-20.